Bake a round cake the size that you need. 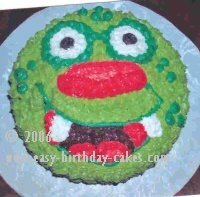 With an icing filled bag and round tip, size #5, draw a monster face on the cake top. Use a star tip, size #16 to do all of the fill in work and a round tip, size #5 to do all of the outline work. With white icing, fill in the whites of his eyes and his two teeth. Fill in the center of his eyes and the center of his mouth with black icing. Make a dark green color icing and fill in around the eyes. Also do the spots on his face. Use pink icing for the tongue and red icing for the corners of his mouth and the bottom part of his nose. The top part of his nose is done in a light red icing. Make a yellow green color icing and fill in the rest of his face. Outline the mouth in the dark green icing and the nose in red.